My favorite trucks are ones that can haul stuff, are easy to park, decent on gas, and ideally, can annihilate tires when I want them to. Meet the 2014 Ford F-150 Tremor, which sounds like it can do all of those things. The Tremor is basically a baby performance F-150. I say "baby," because it only comes in short cab, short wheelbase form. It's not a Ranger, but it's about as small as Ford trucks get these days. And it sounds like it's a blast to drive too. 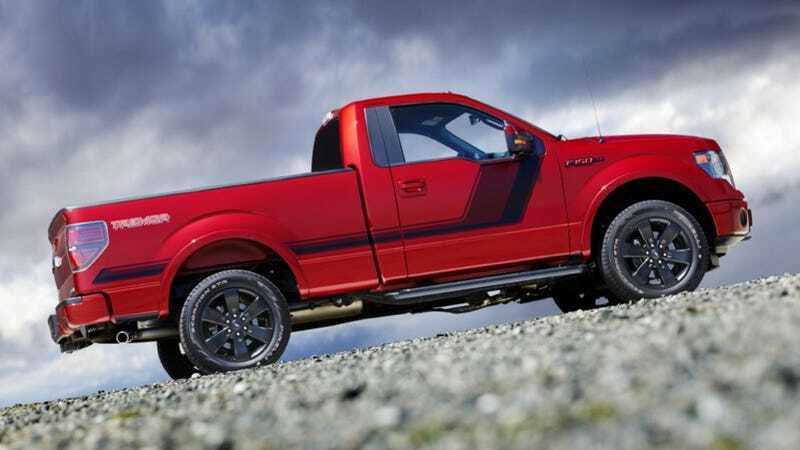 The Tremor packs the 3.5-liter EcoBoost V6 with 365 horsepower and 420 pound-feet of torque that you can get in other F-150s, but it has a 4.10 rear axle, the shortest final drive ratio the F-150 offers, for strong acceleration and the occasional truck burnout. Other goodies include a floor mounted shifter (yay!) 20-inch black wheels, HID lamps and an exterior graphics package. You can get it in two- or four-wheel drive. It may not be a Raptor, or a Lightning, but it's a small and affordable performance truck with a turbo engine. I could definitely get behind this.